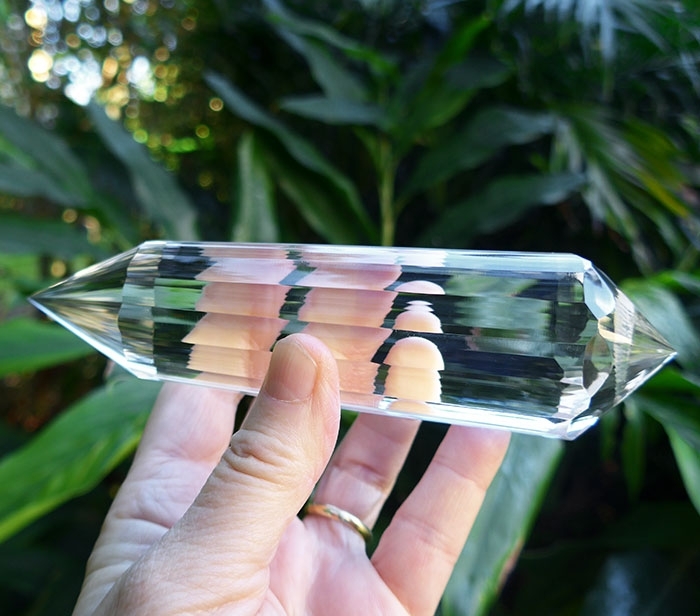 Dimensions (HxWxD): 6.25" x 1.5" x 1.25"
This extremely rare Water Clear 88 Facet 8 Gate Master Cut Dream Flower Vogel Healing Wand is extraordinary in every way. 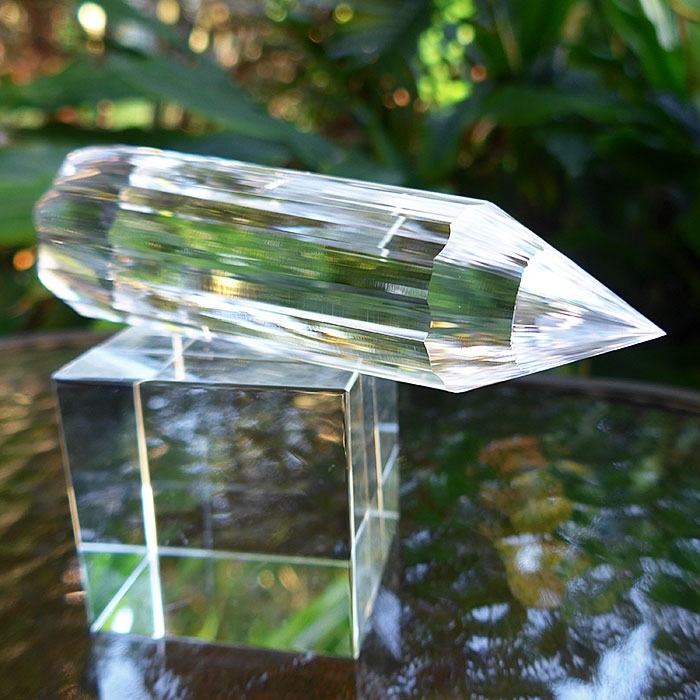 This amazing professional lightworker's tool measures 6.25 inches long and weighs 12.2 oz., 347 grams, or .77 pounds, yet it is perfectly balanced, easy to hold in the hand during extended meditation or crystal healing sessions. This unique wand has 88 sparkling flat facets on the female termination tip, 88 facets on the male tip, and 8 concave facets on the shaft. This is a NEW style of Dream Vogel Wand that Ray created in 2013, to improve the look and energetic power of these gorgeous healing tools. We got this amazing new Vogel Wand from Ray in January 2019 as part of a shipment cut especially for us at Satya Center. 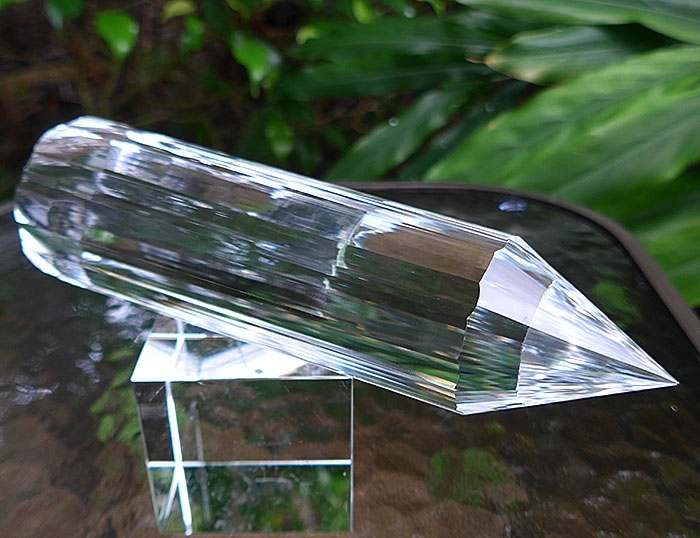 It is one of the most ambitious and elaborate cut crystal healing wands ever conceived and executed on planet Earth. 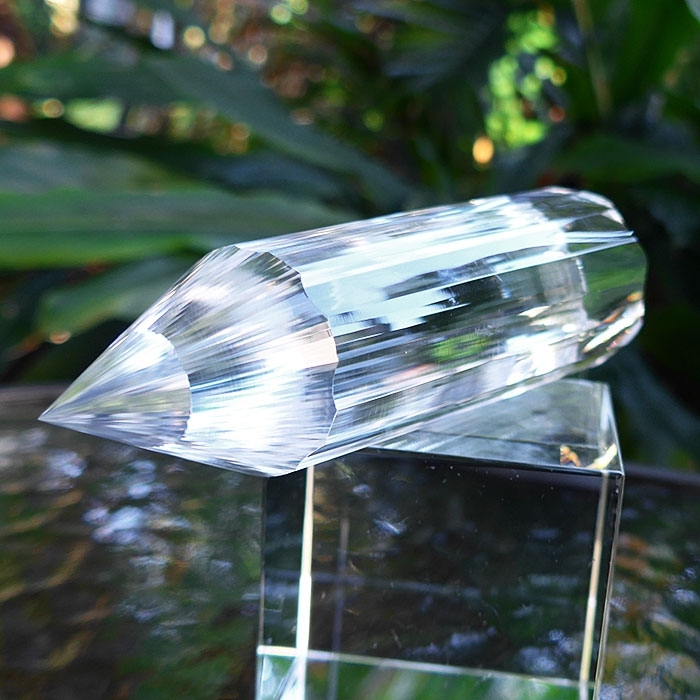 This design was created by Brazilian Master cutter Ray Pinto to optimize the flow of Universal Life Force Energy from Source into and through this remarkable tool for crystal healing. 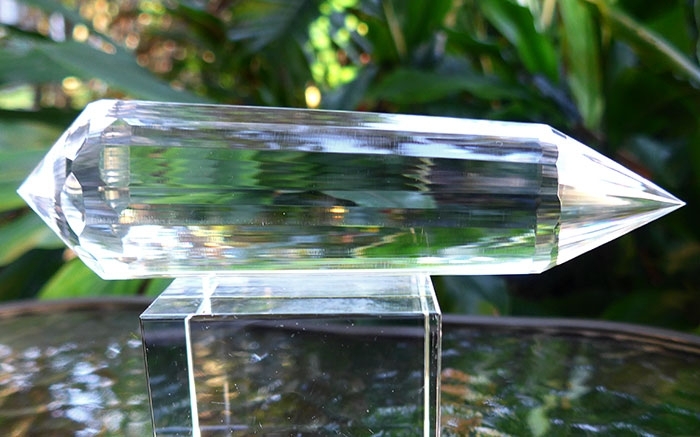 The energy of this amazing Vogel wand is that of clear water rushing down a mountain stream, refreshing and washing away all blocks, sorrows & detrimental energies. Energetic Properties of the Eight Sided Vogel Wand -- and of the Eighty-Eight! 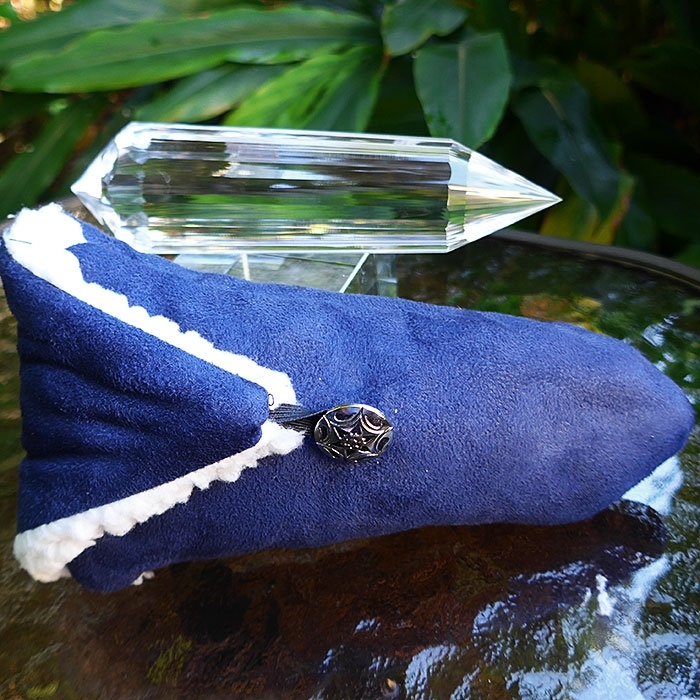 We are pleased to offer this one-of-a-kind Vogel healing wand to our customers! 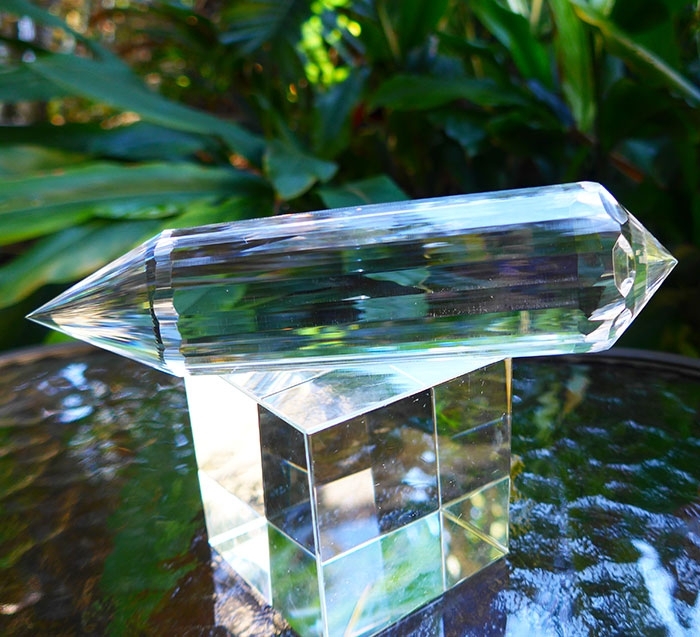 This precision cut crystal, cut according to the specifications of legendary IBM scientist and crystal healer Marcel Vogel, is a powerful instrument, and can be used for many kinds of healing work as well as for meditation. 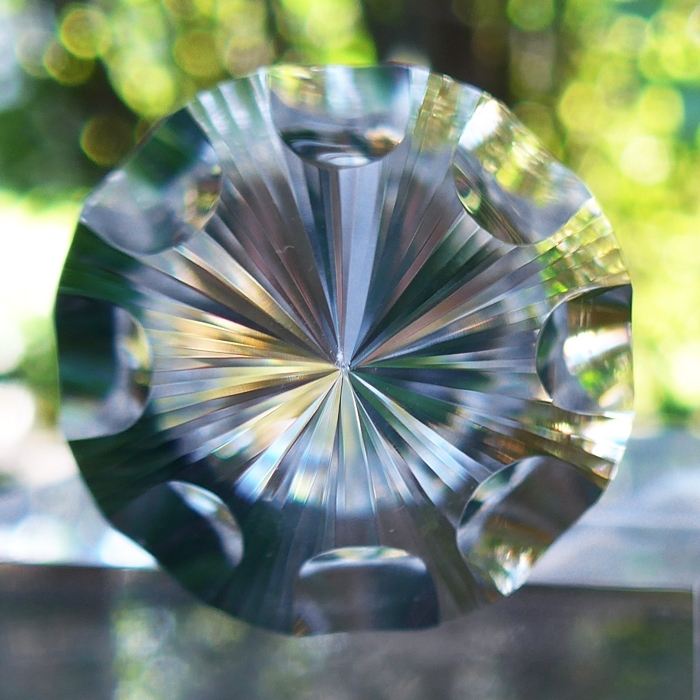 Marcel Vogel believed that a healing crystal cut with 8 sides has a very special energy signature, enabling crystal healers to work on the physical, astral, and mental bodies of the subject simultaneously. This amazing 88 sided 8 gate Vogel wand has the same octahedral sacred geometry but the power of this wand is like that of an 8 sided Vogel wand multiplied many times. "The eight sided crystal moves beyond the physical body," Vogel explains in the manuscript of his previously unpublished book, soon to be published by Satya Center under agreement with the heirs of Marcel Vogel. "It is designed to remove multiple layers of pattern which do not come out with a four or six-sided crystal. The eight-sided crystal has even sharper angles on the tips. The rate of penetration is even higher. And the precision you must work with is even more exact. With an eight-sided crystal you can link with the subtle bodies of a person, their programming, and with the total intention of that person to be free and move on their path. It can be used for difficulties involving deep shock, severe trauma, difficult birth experiences, et cetera, touching down into the soul level. . .They are serious instruments to be used for healing and therapy and for a higher purpose, to serve mankind." Pinto says that the design is unique in its ability to connect us with our own Divinity so that we may more fully emody Unity Consciousness here on Earth. 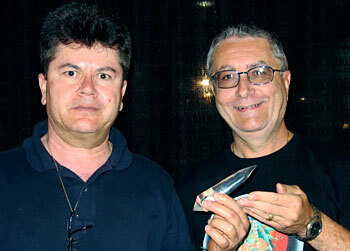 For many years Ray produced 3, 4, 5, 6. and 7 gated Dream Vogel Wands, and only in the last couple of years has Ray produced the remarkable 12 Gate Dream Wand with 108 Facets. Now Ray Pinto has created yet another breakthrough design, a 21st Century update of the extremely powerful and popular Dream Flower Wand. Pinto's latest design, contains an astounding 8 Gates on the shaft, connecting the receptive female tip with the shaft of the wand energetically, and enhancing the flow of Universal Life Force Energy into and through this unique crystal creation. 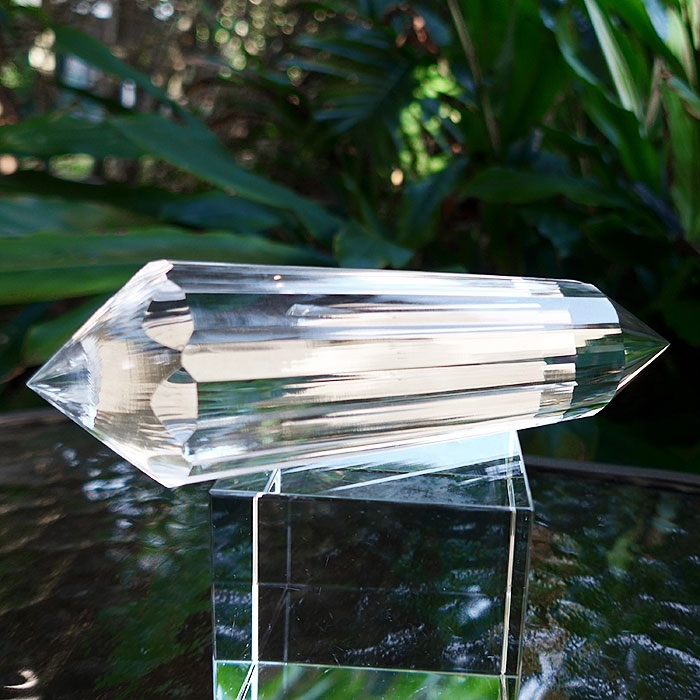 This amazing wand has 88 facets on the male and female termination tips, 8 concave facets on the shaft, and 8 flower petal indentations on the shaft to optimize the flow of Universal Life Force Energy from Source into and through this remarkable tool for crystal healing. Note: weight above is shipping weight. Net weight is 12.2 oz., 347 grams, or .77 lb.